Kailangan ang browser ng Opera. 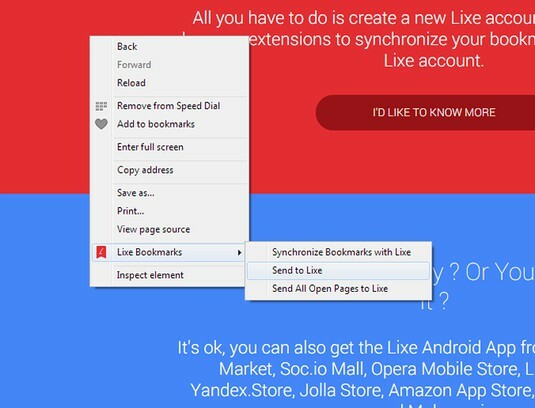 ★ Synchronize all your bookmarks with your Lixe account in just a few seconds, (click anywhere on the page with the mouse right button and choose “Lixe Bookmarks” → “Synchronize Bookmarks with Lixe”). Lixe will do the entire job in the background leaving you completely free and it will notify you once done. ★ Save new bookmarks instantly with right-click context menu: click anywhere on the page with the mouse right button and choose “Lixe Bookmarks”. 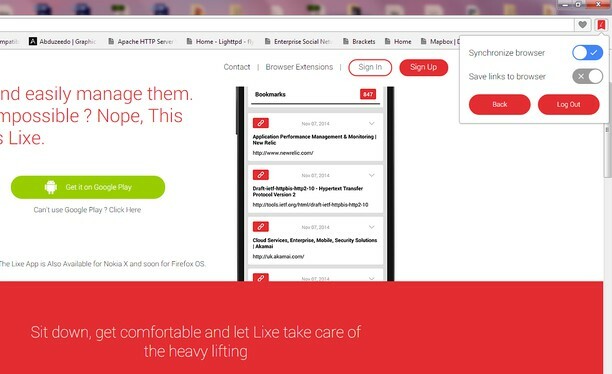 You can save the current page by choosing “Send to Lixe” and if you want you can also save all open pages by choosing “Send All Open Pages to Lixe”, it can’t be easier than this!, the great thing is that Lixe does everything in the background leaving you free to surf the web, once done Lixe will automatically let you know. By using the context menu all the links are saved in the main Bookmarks folder. ★ Organize with Folders: Save the current link or all open links into a folder of your choosing if you have more than one, (left-click on the Lixe Bookmarks icon that appears in the top-right corner of your browser → select a folder → save the bookmark or save all open links by switching to all “Save All Pages”). ★ Save multiple bookmarks at once: click anywhere on the page with the mouse right button and choose “Lixe Bookmarks” then “Send All Open Pages to Lixe”. ★ Fast and Light add-on to meet all your needs. ★ Under your control, you choose what bookmarks to save in the browser you are using, in case you are not home and you want to remember a link you can save it just in your Lixe account. 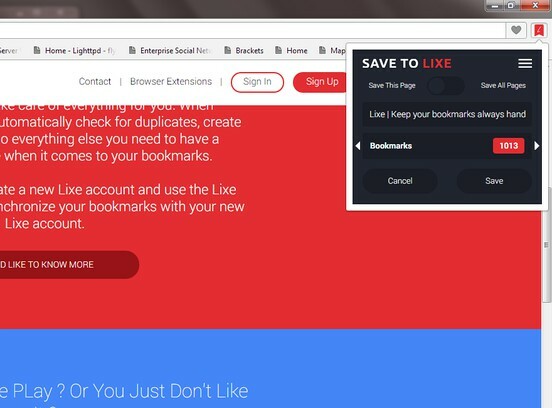 ★ When a bookmarks gets saved using the default browser controls, The Lixe Bookmarks Add-on will automatically save it for you also in your Lixe account. Lixe is a free service that allows you to synchronize your bookmarks and manage them using the Lixe web interface and the Lixe Android app (Available for free Google Play and in alternative app stores). Not at home? Need a link saved in your browser but you don't remember it? No problem, just access your Lixe account to instantly find all your bookmarks privately and safely stored. With the official Lixe Android App you can easily manage and access your bookmarks on the go. Edit, move, delete, add new links, search bookmarks and switch folders with just a gesture of your fingertips. Lixe Bookmarks is also available for Opera, Mozilla Firefox, UC Browser Android, (Soon also for Apple Safari, Dolphin Browser for Android and Mozilla Firefox for Android). Ma-a-access ng extension na ito ang iyong data sa ilang website. Ma-a-access ng extension na ito ang aktibidad ng iyong mga tab at pagba-browse. Limits the number of items the browser will keep in history by days. Adds selected words from the page to your personal dictionary. Kailangan mong mag-sign in para mag-rate o magrepaso. Wala pang mga repaso. Maging unang mag-post ng repaso!